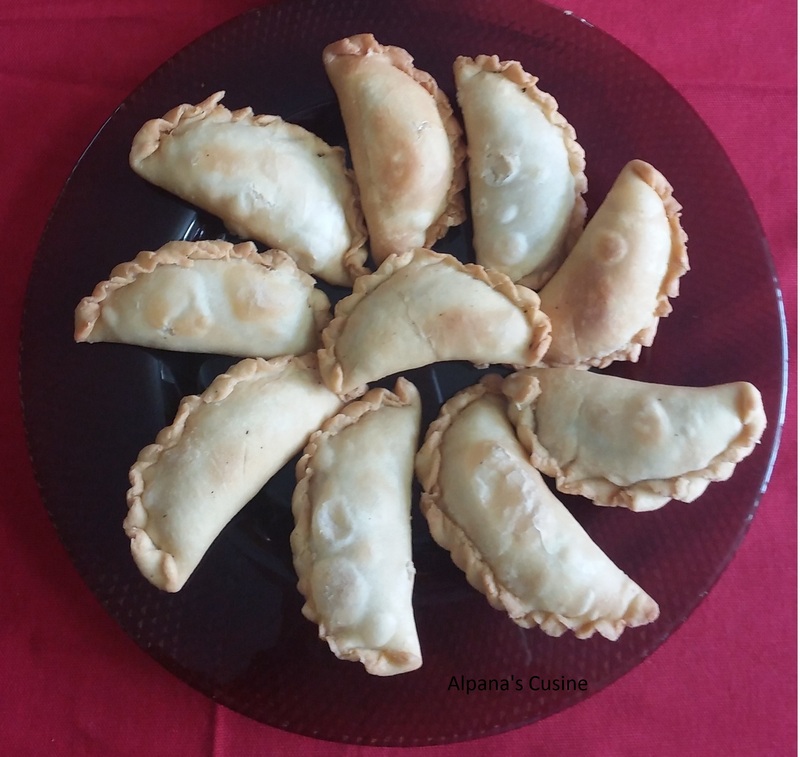 Gujiya is very popular and famous dish in North India.They are made mostly during festive time.There are many variations in stuffing recipe of Gujiya like it made with khoya-mawa ,sooji,dry fruits, dipped in sugar syrup etc…Different region has different name of Gujiya like in Bihar -Pedakia , Maharashtra-Karanji, Gujrat-Guhara but the shape is same and name is different.Here is the recipe of Khoya Gujiya . In a bowl take multi purpose flour ,150 grams melted pure ghee,mix ghee and flour with hands and rub in your palms. Then add water slowly to make firm dough. Cover the dough by moist muslin cloth and keep for one hour. Crumble the Khoya , heat the ghee in a pan and add Khoya . Now add sugar powder, chopped raisins, Cardamom powder and mix it well. Take the dough and divide in equal portion and roll out it like small poori. Put one and half tablespoon khoya mixture over the poori and apply little water on the edges of half side and gently press the edges. Make a semi circle shape after pressing edge and design the edge by your thumb or Gujiya cutter. Now heat the oil in the deep fry pan or kadhai and gently slide the gujiya into the oil and fry the gujiya from both side till it become golden brown. Drain the Gujiya on the absorbent paper. ENJOY THE KHOYA GUJIYA IN THE FESTIVE OCCASION.